A mod tank called Centaur. Built with 469 of the finest parts, its root part is EmberCockpit. CMAU Incorporated proudly presents our newest tank, the Centaur. Named after mythical beasts that were part Ker-man, part horse, this tank mirrors their renowned strength. Equipped with medium armor plating and heat deflecting radiators, this tank is designed to act the dual role of fighting both ground and air units at the same time! 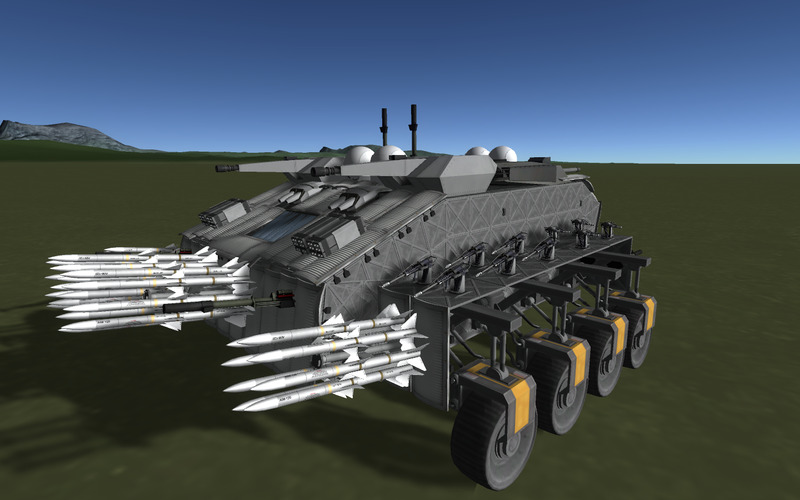 As for weaponry, this tank has it all. Holding a massive 32 AIM-120 AMRAAM missiles, 20 M230 30MM chain gun turrets, 12 .50cal turrets, four M102 Howitzers guarding its back, two on top for attacking air units, two on the front for ground based fights, four Airborne Lasers, twin Hydra-70 rocket turrets, twin Oerlikon millennium cannons, twin Abrams Tank cannons, and two guns Jeb couldn’t figure out how to use, but since they looked cool, he persuaded ([cough] begged[cough]) an engineer to put them on anyway. As far as non explosives go, this amazing tank features a deluxe long distance radar that can lock on to up to six different targets at once, twin radar data receivers, twin ECM-J radar jammers, and twin radar warning receivers. When Jebediah was done testing, the entire space center lay in ruins and Mortimer had handed in a resignation form for the fifth time that day. 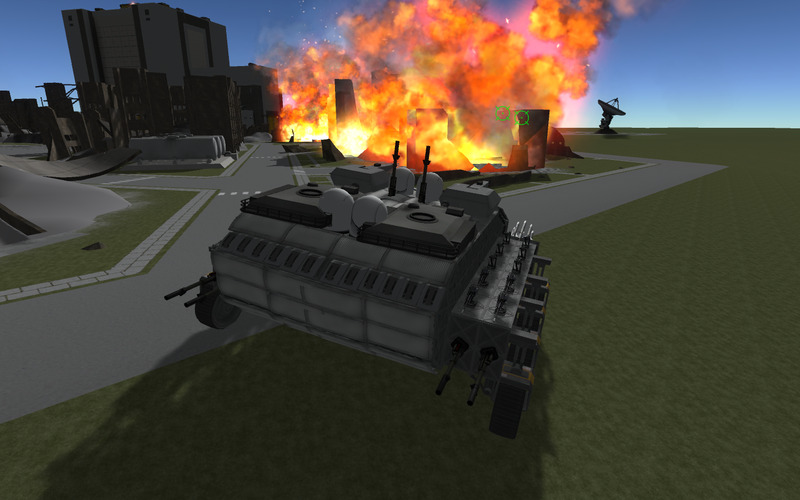 Jeb was reportedly drooling over the sheer number of explosions he could cause with just that one tank. When Valentina tested it, she remarked that it was a well rounded tank, was well armed, armored, and actually drove well, considering that it was approximately the same size as the Soulflare. No major complaints were lodged by anyone other than Mortimer, and the local news reported (again) on the fact that Jebediah had destroyed the entire space center for the second time that day. Most Kerbals reportedly liked the bulletin, because of the excellent explosion footage caught on camera. Order today, and you too can cause these amazing explosions! !